Wearing hot accessories will help you beat the summer heat! 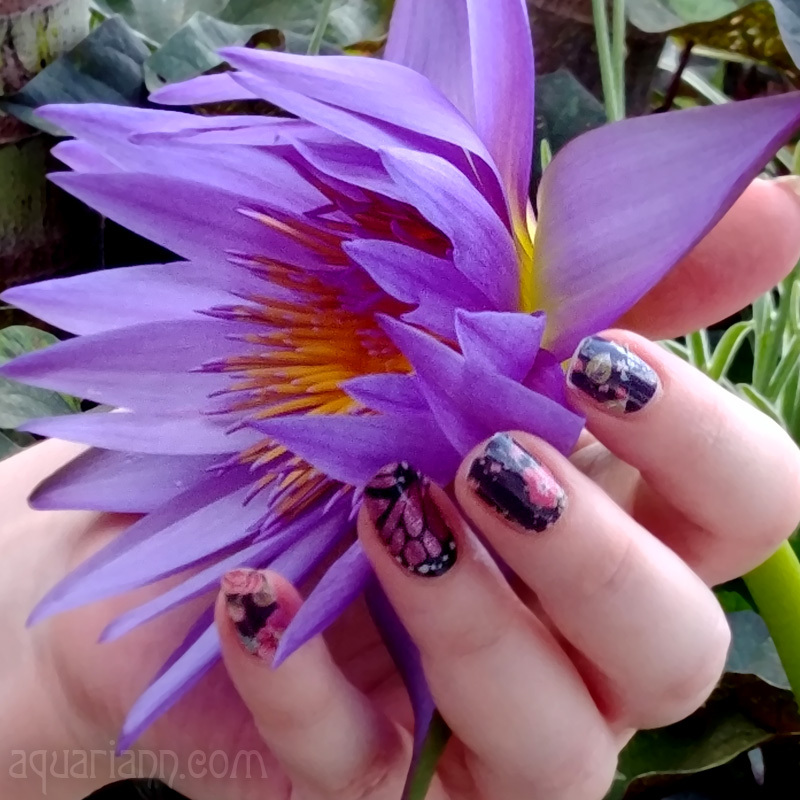 Branch out to Beadmask, Life is the Bubbles, Purple Peacock Jewels and Athenianaire for red earrings and jewelry. Beadmask's bead embroidered earrings are as hot as the sun they abstractly resemble! The striking design showcases a pair of vintage glass cabochons in ruby red. The stones are surrounded by glass seed beads in shades of matte metallic bronze and color lined brick. Radiating out from the stone is a series of glass spike beads in silky bronze. 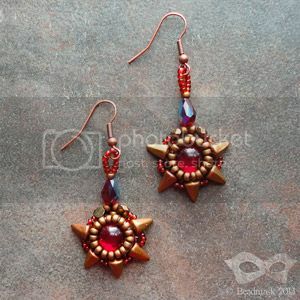 The red earrings are backed with brown leather and dangle from "antique copper" (plated brass) earwires. 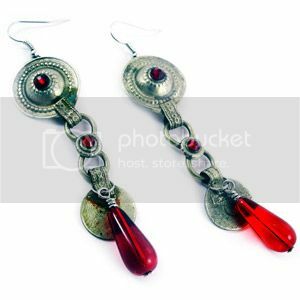 Purple Peacock Jewels' Kuchi earrings will make you sparkle like the Red Desert Moon, whether you're a belly dancer or not. The vintage Kuchi elements were carefully selected and mixed with modern Swarovski crystals and Preciosa findings to create a truly stunning piece of Tribal jewelry. The vintage metal has been gently polished to bring back its shine, but its imperfections only add to the charm of this one-of-a-kind accessory. Life is the Bubbles' strawberry jam bottle earrings would certainly win a blue ribbon at the state fair. The cute design was inspired by Main Street Disneyland’s Market House and the flitterin’ Fun Movie, Disney’s Summer Magic! 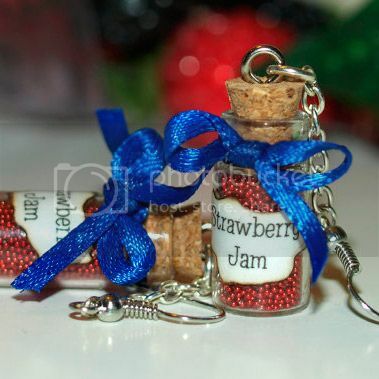 The miniature jars are filled with red micro beads and securely corked to preserve the strawberry magic inside. The darling earrings measure 2.5" from hook to bottom of bottle and only weigh 0.1 ounce. Athenianaire's red, white and blue rings make a strong fashion statement for freedom. 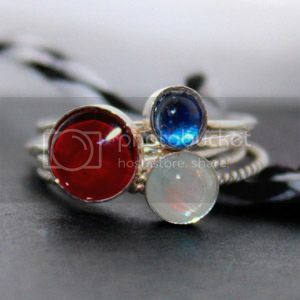 The patriotic ring set includes three stacking rings and two spacer rings. The brilliantly colored circles are crafted from rainbow moonstone and real red and blue butterfly wings. Not only will you be supporting your country, but also helping to fund butterfly preservation farms so more butterflies can flutter freely.